This is plate 36 from Robert Melville Grindlay's 'Scenery, Costumes and Architecture chiefly on the Western Side of India'. Grindlay (1786-1877) was only 17 when he arrived in India in 1803. He served with the Bombay Native Infantry from 1804 to 1820 and during this period made a large collection of sketches and drawings. 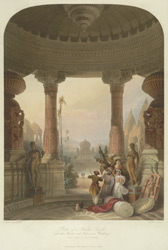 In this image Grindlay imagined a spectator standing in the porch of an exquisitely decorated Hindu temple at Modhera in Gujarat, which Grindlay compared favourably to anything produced in ancient Greece. Colonel Monier-Williams, the Surveyor General, said of the site: "This is one of the finest specimens of Ancient Hindoo architecture ... I ever saw ... We spent some time every day in inspecting the place; but such is the variety of its beauties, that it would have taken a much longer time than we had to spare to have discerned them all or have gained a faint idea of the general design."